Koyaaniqatsi remains the most effective and poignant use of imagery and sound to find the context of man’s impact on the world as large. Each of the Qatsi films, remarkably unique in visual style but unified by Philip Glass’s hypnotic music and Reggio’s ability to shows his audience a different perspective to a world we take for granted. 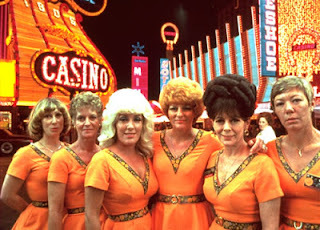 In Koyaanisqatsi, Reggio’s innovative use of time lapse photograph stands out. The sight of those cars rolling over the highway at great speed, visible only by the blurring of their headlights creates a strange abstract and animalistic uniformity to our movements. Holding the camera on a homeless man in close-up staring into camera when normally we pass them on the street with a brief glance allows Reggio to remarkably see into the soul of a broken man. And the film’s superlative final shot, which starts out as the awesome power of a rocket ship bursting into the sky, then exploding and falling down to the earth, then eventually into a miniscule abstract image of a piece of metal spinning around like a top is awesome not only in the sheer length of the shot but the metaphoric encapsulation of Reggio’s theme of a ‘life out of balance’. The Blu-Ray special features connects some of the dots which have been in mind for a while. I had assumed the variance in quality from first film through the last two films was directly related to Ron Fricke’s presence/absence. Hearing the production and post-production stories from Fricke’s interview confirms these suspicions. As the credited cinematographer and editor Koyaanisqatsi is clearly as much Fricke’s film as Reggio’s – if not more so. This was the only film Fricke worked on, a collaboration which Fricke admits was flexible and sometimes autonomous, allowing Fricke the freedom to shoot what he liked to conform to Reggio’s larger vision. The subsequent films arguably have had lesser returns. Powaqqatsi, made six years later is significantly more modest than the innovation and ambition of its predescessor. Reggio restricts his subject matter to a few culturally specific ‘third world’ areas, documenting the non-Western social and cultural traditions and lifestyle of the aboriginal peoples. Reggio’s visual design is significantly less flashy, though admirable not to rest on the laurels of the first film and repeat himself. Longer lenses and more slo mo are the primary tools to tell his story, often zooming out of abstract images to reveal context and perspective in wider shots. While the visual ingenuity of Ron Fricke is sorely missed Philip Glass's music soars even higher especially the cue reused in The Truman Show. Noqoyqatsi diverges even further, using very little newly shot footage, instead delving into stock footage and computer generated imagery to convery Reggio’s theme of ‘life as war’.